Andy Geldart was top rod on Decoy Lakes. I stopped team fishing several years ago now, like quite a few others around my age, but I have first-hand knowledge of just how much time and effort goes into practicing and indeed fishing the big finals. And I can tell you it’s a drain on time, effort and money let alone your family life. Then at the end of it all come the big day it’s only the chosen few who go home happy. So I have a great deal of sympathy for the Sensas Mark One lads who put in hour upon hour of practicing for last weekend’s huge Angling Trust Winter League Final, still the most sought after team trophy on the country’s angling calendar. Don’t get me wrong, they did extremely well to finish sixth on the day, but sometimes even a great result like that against massively strong opposition doesn’t do justice to the work put in. It’s all too easy to blame the team draw, but at this time of year it’s crucial to pull out a few good pegs and several others you stand a chance from. With the match split between the Fenland Drains and Decoy Lakes a lot rested on those at Decoy picking up a few extra points as the lads fishing the drains returned with a great set of results. Rob Wright and Alistair Ogilvie both won their sections, John Taylor came in second and with Rob Hewison third all eyes switched to the Decoy result. Unfortunately with not a good peg between all five of them the team drifted out of the running leaving Drennan Barnsley to finish out in front. Runners-up were Kamasan Starlets followed by Drennan Oxford. Our other local side, Stanjay Tackle, found it tough going too, finishing in 16th place. It’s no easy job trying to find a few fish after such a big match at this time of year as the JVAC lads found on Sunday fishing the Willows at Decoy Lakes. There were some good leading weights however. Carl White led the way from peg 25 with 52lb. He fished a straight lead approach fished across into deep water netting carp to 6lb. 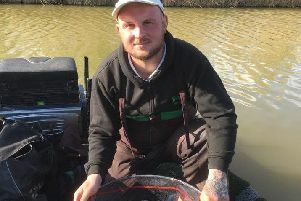 Runner-up was Gus Gausden, who fished the pole with soft pellet for 46lb 7oz, then came Dan Abbott on 42lb. The Over 55s match fished on Friday on the Yew Lake at Decoy saw Roy Whincup take first place with 81lb 13oz fishing a small maggot feeder. The long and short pole line with red maggot earned Mike King second place with 54lb 8oz, then came Shaun Best with 52lb 10oz.